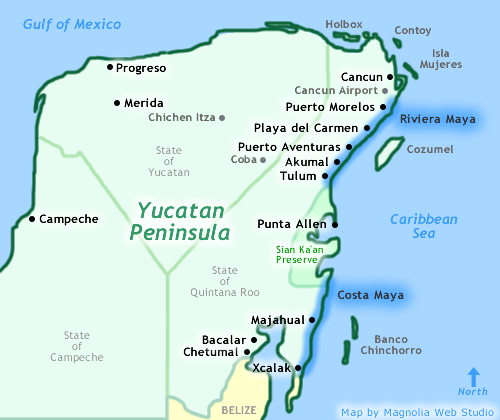 This map shows general information about the Yucatan Peninsula and has specific information for the State of Quintana Roo. The location of Cancun, Playa del Carmen and Tulum can be found on this map. The map also shows the towns in the Riviera Maya and in the Costa Maya. The map also shows the location of Isla Holbox, in the north of the state, of Isla Mujeres (Isle of Women) and of Cozumel, both of the eastern coast. On this map you can find the important Mayan ruins of Chichen Itza and Coba. The map also shows the location of Bacalar which is home to the spectacular Bacalar Lagoon (Laguna Bacalar) which is 26 miles long (42 km) and just a mile wide (2 km).